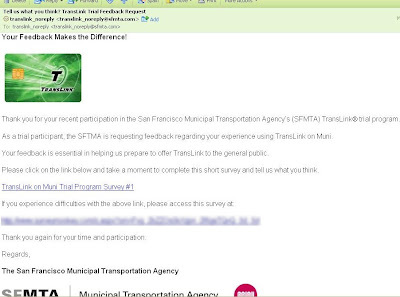 So after all the suffering by us Translink card testers, SFMTA/Muni finally releases their first survey to their volunteers. Records from the SFMTA meeting shows that the public test phase of the program started in November 2008, and after three months, their survey is now available. This was sent via e-mail. If Translink and Muni's plans are correct, their goal is to conduct an even larger public trial of the program this April and eventually be released for every citizen to use in "2009." Now Muni did not say when in 2009, maybe just to cover their nuts if they set an actual day and month and I catch them failing in their part. Now as always... this is city government, and when they say "24 hours," they actually mean one week. Plus, it does not yet work on BART and Caltrain. These two agencies are up next for the Translink trial program, but there is no word from either agencies on their progress. If BART can get linked-up, then you have the perfect network to ride all these agencies in the city, East Bay and North Bay: Muni (on trial), BART (not yet ready), AC Transit (in full public use), and Golden Gate Ferry/Transit (in full public use). Adding Caltrain will extend that network as well, but BART is extremely vital to the full success of a "one card" program since it connects with a ton of transit agencies. Regardless if you have a Translink card or not, sign-up to be a volunteer (a.k.a. victim) of the testing program for Muni: http://www.sfmta.com/cms/mfares/translink.htm. People who do not have a card can get one for FREE. Stupid bus drivers who hate their jobs and don't like Translink users. Muni employees mouthing-off at you. Mayor Newsom saying... what the hell is that card? I love mine, and I've had only one problem, in which I had to explain to a 33 driver what Translink was (needless to say, the machine was off). To his credit, he was really friendly about it and gave me a transfer, since it wasn't my fault. Tour of California - Closing roads TOO EARLY? The Death of Bay to Breakers?